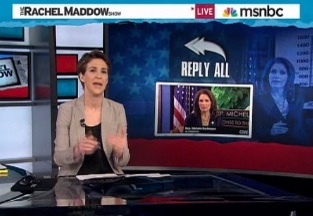 Rachel Maddow took on CNN for the network’s decision to air Michele Bachman‘s “Tea Party address” following President Barack Obama‘s State of the Union address and Republican Paul Ryan‘s own speech. Maddow shared clip after clip from CNN wherein various contributors questioned the descision to give airtime to Bachmann’s speech, calling it redundant in light of Ryan’s own, official speech… immediately followed by Wolf Blizter plugging the fact that CNN would exclusively be airing the speech. She then sought to define what, exactly, the Tea Party is and isn’t – most notably reiterating that is not a “Party,” especially not something completely distinct from the Republican party. She gave viewers a little history lesson, referring to political consultant and strategist Sal Russo‘s “Tea Party Express” bus tour and his questionable financial practices. The Tea Party Express, she continued, while financially successful and well-publicized, is distinct from the Tea Party as a very real movement. The “Express” is not a movement, said Maddow, but a means of raising money for a conservative consultancy – Russo’s, to be specific. Maddow argued that in airing Bachmann’s “official Tea Party response,” as CNN itself dubbed it, the network was essentially painting as a third, co-equal political party. Which, influential and real as the movement may be, is just isn’t. Yet anyway.